Bills targeting "sanctuary cities" failed to pass the Texas Legislature in 2011 and 2015, but similar efforts this session have better chances of making it to Gov. Greg Abbott's desk. The Legislature is gearing up for a fight over "sanctuary cities" bills — and not for the first time. The current debate was foreshadowed by one in 2011, but this time, chances are better that a bill could make it to Gov. Greg Abbott's desk. Texas’ proposed 2011 ban on sanctuary cities, the common term for local entities that don’t enforce federal immigration laws, would have authorized local police to inquire about the immigration status of anyone they arrested or detained. It led to fears that immigrants wouldn’t report crimes and that officers could detain people based solely on skin color and turn them over to federal immigration officers. 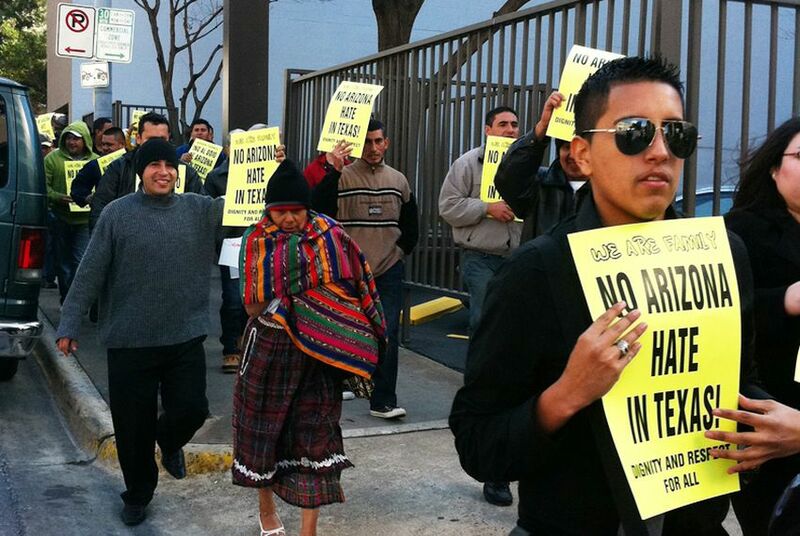 “Texas Can Do Better” and “No Arizona Hate” were common mantras from critics of the legislation that reverberated around the State Capitol in 2011 — references to a controversial Arizona bill that expanded the immigration enforcement powers of local law enforcement and passed that state’s legislature in 2010. Bills filed in both chambers — Senate Bill 4 by state Sen. Charles Perry, R-Lubbock, and House Bill 889 by state Rep. Charlie Geren, R-Fort Worth — would allow local police to enforce immigration laws, but only if the officer is working with a federal immigration officer or under an agreement between the local and federal agency. It would also punish governments if their law enforcement agencies — specifically county jails — fail to honor requests, known as detainers, from federal Immigration and Customs Enforcement officers for sheriffs to hand over immigrants in their custodies for possible deportation. The punishment would be a denial of state grant funds. This time around, one border Democrat has conceded that he could support the detainer component of the current proposals, especially if it means it will keep more extreme measures at bay. Sen. José Rodríguez, D-El Paso, said data from ICE and testimony from county sheriffs earlier this year shows that county jail compliance isn’t the issue Republicans make it out to be. The ICE component of the legislation has become a major focus for Republicans, especially after Dallas County Sheriff Lupe Valdez drew Abbott’s ire in 2014 after she said she would cooperate with ICE only on a case-by-case basis. New Travis County Sheriff Sally Hernandez added to the controversy when she was running for office last year, saying she wouldn’t cooperate with ICE. Valdez later said she had been taken out of context, but state officials had already jumped on the comments. Though the legislation doesn't apply to a person that is detained because they are a victim of or witness to a crime, Rodríguez said he still has concerns about the bill because it’s written so broadly that it opens the door to police enforcement. Sen. Perry’s office didn’t respond to requests for comment for this story. But Geren said it’s too early in the process to predict what the final bill will look like and said he is willing to talk to anyone who has concerns about the legislation. Geren was adamant that sheriffs needed to comply with ICE detainers. Lawmakers could also face some pushback from the business community because of a provision in the bill that permits a person to file a complaint with the attorney general if they think that a local government isn't following the provisions of the bill. "If you are a sheriff and I am running against you, all I have to do is to allege you are doing something nefarious, as I read the legislation, and then the [attorney general] has the authority to open an investigation," said Bill Hammond, the former CEO and president of the Texas Association of Business and current president of consulting firm Bill Hammond and Associates. "I stand to be corrected, but a mere allegation not being substantiated could trigger and probably would trigger an investigation of an incumbent. That’s bad politics." Sen. Charles Perry first filed his bill to would eliminate sanctuary cities in November.